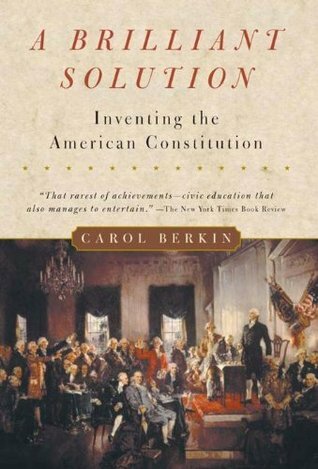 I purchased A Brilliant Solution by Carol Berkin for my Kindle back in July. Kindle books are not my favorite format to read and I rarely use that app on my iPad. Out of sight, out of mind. Before long, I’d moved on to other books and forgotten about this one. In an effort to get my reading life more organized, I gathered all of the books that I had not finished (including Kindle books) and began completing them one by one. I was very happy I picked this book back up. I found this concise telling of the “inventing of the American Constitution” (as the subtitle reads) very intriguing. Her description of the primitive times made me appreciate the physical sacrifices these men made to create a brand new government. My only disappointment was that Ms. Berkin did not include any information on how the Bill of Rights came to be added. Other than that, this is a great place to learn about the writing of the Constitution. Since I finished reading The Real Lincoln, I was fascinated to read that states’ rights were an issue even in the 1780’s. It was startling to read that Madison and Hamilton pressed the delegates to allow the national legislature the right to veto any state law. (p. 98) I am happy that that did not make it into the final version of the document. The founders were concerned about possible future abuse of the government they were creating, and tried to put up safeguards against such. But Benjamin Franklin was optimistic about the future. He believed that “despotism, when it came, would be the result of the innate corruption of the people themselves.” (p. 163) I give a hearty amen to that! Are we not seeing a reflection of the people in the leaders we have chosen? In the end, the men realized that no government is perfect, and no other men would be less fallible than they to create a government. They moved forward in an act of faith in Providence. Ms. Berkin does her best to bring each character in this historical drama back to life. Quirky personality traits and styles of dress and manners are included with each man to help the reader keep them separate in his mind; which is a difficult task for fifty-five men, many about whom there is very little known, and some of whom had similar names. There were several “Williams” and two Charles Pinckneys! At the end of the book, there are brief biographies of each of the men, which makes a nice reference guide. Also included in the appendix is copy of the Articles of Confederation and the Constitution. I had always credited James Madison with the actual wording of the Constitution, particularly the preamble. While Madison certainly had a strong hand in the writing of this document, it was actually a peg-legged man named Gouverneur Morris of the Pennsylvania delegation who styled the words which we now enjoy. On the story of President Washington’s inauguration, Ms. Berkin writes: “Scores of New Yorkers assembled in churches, where they heard their ministers ‘implore the blessings of Heaven on the nation’. Coming out of church, they saw the clouds dissipate and the sun shine brightly, a sign to many that the heavens had responded to their request.” (p. 197) May it be so today, as well. This is not a drab book of political jargon. It is a story of a few men and their courageous undertaking. It’s a story of men who argued – oh yes! – but ultimately came together for the good of the future. I know very little about American history and this would be a good book to read. Thanks for sharing your thoughts. I will check this out on Amazon UK. Have a great week ahead.